Home » Catalogue » MAHLER: SYMPHONY NO. 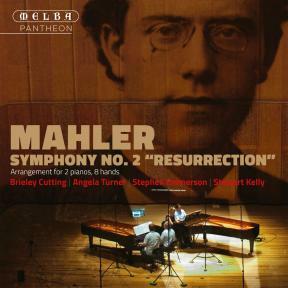 2 "RESURRECTION"
While one might imagine that Mahler's wonderful orchestration in his Second Symphony “The Resurrection” is essential to his music, translating it to the sound-world of an eight hand two piano arrangement allows it to be heard quite differently, refreshingly and just as powerfully. This is the 100th anniversary of the arrangement (published by Universal), of Heinrich von Bocklet's 1914 “double duet” which followed an earlier four hands version in 1895 and one by Bruno Walter in 1899. The 2 piano arrangement of Mahler’s Resurrection Symphony enables this glorious music to be heard and appreciated afresh.Stripped of its massive orchestral forces this “unplugged” piano version reveals facets of Mahler’s beloved masterpiece anew, its lyrical voices and harsh drama. It remains uniquely overpowering, an epic journey. The music becomes more intimate with more of the personal interactive qualities of chamber music. Mahler himself seems to have had a special fondness for his Second Symphony. After a decade in charge of the Vienna Philharmonic it was this work that he chose to conduct at his final concert with them. Moreover, it was the first of his symphonies to be performed in America and in Paris. Begun in 1888 (when he was 27 years old) the symphony took six years to complete, for him an uncharacteristically long time. In 1891 Mahler had played the first movement on the piano for the conductor Hans von Bülow who was very disparaging about it. “If that is still music then I do not understand a single thing about music!” von Bülow is reported to have exclaimed. The middle three movements were composed over the summer of 1893 but Mahler evidently was unsure how to proceed. Ironically it was at the funeral of von Bülow in February 1894 that Mahler was struck by a flash of inspiration revealing to him how his symphony should conclude. Despite Mahler’s doubts, its first performance in Berlin in 1895 was an unexpected triumph. Though the work was inevitably attacked by the critics, there were many who realised that with it a new force in music had arrived. Bruno Walter responded to the Second Symphony by declaring he recognised “with absolute finality that there lay my life’s task, to pledge my future energies to Mahler’s creations”. Schoenberg, who was also present, was similarly overwhelmed by the experience. When Alban Berg first heard the symphony some years later, he was so shaken by its evocation of the Day of Judgement that he immediately confessed to his fiancée that he had been unfaithful to her! As Mahler famously once said “The symphony must be like the world. It must embrace everything,” and this symphony has all the richness and variety of a world complete unto itself. Its overtly dramatic first movement, a funeral march, is followed by a second of disarming charm and simplicity. The third, a scherzo based on material from one of his Wunderhorn songs about St. Anthony preaching to the fishes, abounds in delicious irony. The fourth movement ‘Urlicht’ (Primeval Light) is again based on a Wunderhorn text (about a child who refuses to be deterred from entering heaven) and must be among the most divine songs ever penned. The fifth movement’s culminating finale must be nothing less than overwhelming. There was hardly a precedent for such a work, not only in its ambitious scale but in the distinctive originality of its language and the ravishing beauty of so many of its details. Of course, performances of such works would have been rare and so very few people would have had the opportunity to become acquainted with this music in concert. As a result, most symphonies throughout the 19th century were commonly transcribed and published for both piano solo and duet. Before the advent of radio and sound recordings this was the best way for musicians – both professionals and amateurs – to become familiar with the repertoire of symphonic music without having to leave home. Admittedly most symphonic arrangements for piano were intended more for domestic settings than public concert performance. But, even with careful reductions of the material, the complexity of most symphonies lie well beyond the reach of any but the most virtuosic pianists (as, for example, Liszt’s extraordinary transcriptions of Beethoven and Berlioz symphonies attest). Mahler himself arranged a number of his symphonies for two players on two pianos. But for a symphony as massive as the Resurrection even four hands on two pianos would be stretched to cover all the material and provide an appropriate sense of sonority. Arrangements of the “Resurrection” had already been made for two pianos by Hermann Behn (Leipzig, 1895) and for piano duet by Bruno Walter (1899). But we were more intrigued by the possibilities of Heinrich von Bocklet's version for two pianos but with eight hands, that is, for a double duet as it were, published by Universal Edition in 1914, a few years after Mahler’s death. In fact, a surprisingly large volume of symphonic music was arranged and published for this combination around the turn of the 20th century. The fact that a piano (or two) can evoke a wide palette of colours and indeed orchestral sonorities with a degree of success may at first seem surprising. Ravel and Debussy have shown how orchestral music can remain equally dazzling, colourful and evocative in their own versions of their music for piano duet. Stravinsky’s The Rite of Spring was first published for piano duet and is now frequently presented in this form. However, the symphonic repertoire has been presented on piano(s) less often. To our knowledge, this is the first recording of a Mahler symphony in this form. The melodies, harmonies and rhythms – of course – remain, as do the musical gestures, the infectious dance rhythms, the sense of forward drive and momentum, the clear but surprisingly complex contrapuntal textures, not to mention the anguish, the joy, the purity, the spiritual transcendence and the astonishing richness of this music. All these essential elements remain in a form that need be no less dramatic or expressive than the original. On pianos, the Second Symphony may be less grandiose (perhaps, some might say, less bombastic) but then, conversely, it may become more intimate, with more of the personal interactive qualities of chamber music. It certainly enables this glorious music to be heard and appreciated afresh.